Fromelles, Lt Col WEH Cass and family collections. A studio photo of Lt Col Cass perhaps around the time of his posting to France. AWM photograph A01470, copyright expired. The photo is shown as Lt Col ERH Cass CMG so it appears the initials are a mistake. “But the toll of missing is getting smaller. It is not quite the disaster which at first appeared. I would say we lost something between 4000 and 5000”. Such are the relatively dispassionate words entered in the diary of Australia’s military historian, Charles Bean, after the Battle of Fromelles on 19/20 July 1916. [i] However the personal reality for the men was quite different. Lt Col Walter Edmund Hutchinson Cass commanded the 54th Battalion during that battle and also had a role with the 53rd who’d lost their commanding officer. The 54th had come too close to being outflanked by the Germans and only a calm head and experience combined with the extreme bravery of the messengers Cass sent to HQ, got the survivors of the battalion away safely. Only days later on 22 July 1916 Cass was admitted to the Officers’ Rest Home with shell shock and discharged 10 days later. [ii] The human devastation of the battle hit him hard and he reportedly accused his superior officer, General McCay, of slaughtering his men – an insubordination that might well have seen Cass court-martialled in another army. [iii] Fromelles was one of Australia’s most severe battles and regarded by soldiers who’d been there as worse than Gallipoli[iv]. Australia’s casualties totalled 5533. 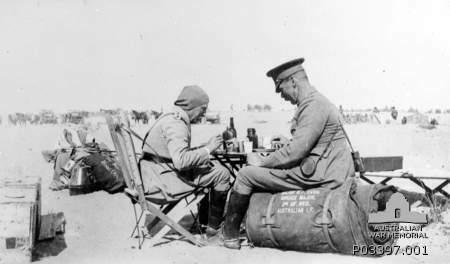 Colonel McCay and his Brigade Major WEH Cass in Egypt, December 1914. AWM photograph PO3397.01 copyright expired. To put Cass’s injury in perspective he had just spent over a year in the Dardenelles and was wounded twice before being evacuated. He had also served in the Boer War. This was a man who was experienced and familiar with the devastation and human costs of war. He had been mentioned in despatches by General Haig and been awarded the Cross of St Michael and St George (CMG) in January 1916. He was once again mentioned in despatches in 1917 and recommended for the Distinguished Service Order (DSO) for his role at Fromelles but he would never go back into battle. It seems to me that he must have been held in high regard to be exempt from being returned to the field on the Western Front. 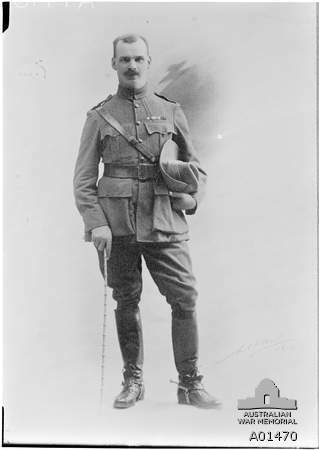 Charles Bean, official historian for the AIF in WWI, wrote of Cass: “the leaders of the AIF were mostly generous men, and marked for their sense of duty; but there were perhaps few in whom the recognition of duty was quite so strong, or sympathy with the rank and file so keen, as in Walter Cass”. [v] Cass relinquished command of the 54th and took over command of the 14thTraining Battalion at Larkhill. His experience in South Africa, and at Gallipoli and Fromelles would have been invaluable to those under his command. Two excellent exhibitions at Melbourne’s Shrine of Remembrance in June 2012. Both had personal interest to us. Soon after arriving in England Cass married his long-time correspondent, a Canadian nurse and journalist, Helena Holmes. The silver tea tray given to the couple by his men, testifies to the regard in which the soldiers held their commanding officer. Extracts of his correspondence with Helena, kindly shared with us by his granddaughter, reveal a witty, clever, ambitious and romantic man. Interestingly he was very frank about the risks of war with this woman who he had been courting assiduously for a number of years: a tribute to her resilience, or perhaps even a test of her capacity to be a career officer’s wife. Walter Cass had some amazing experiences, serving in the Army both before and after World War I. He attended the 1912 Delhi Durbarwhich was held to celebrate the coronation of King George V as Emperor of India. After returning to Australia in 1917, Cass held a number of roles which gave him remarkable social opportunities. He was State Marshal for the 1927 Melbourne visit of the Duke of York (later King George VI); was involved in the organisation of the celebrated arrival in Melbourne of Ross and Keith Smith after the great London-Australia air race 1920 and in his official capacity met many interesting people from Japanese naval officers to the Governor. The man who had survived war and battles, died at home after an operation for appendicitis on 6 November 1931, shortly before penicillin became widely available. 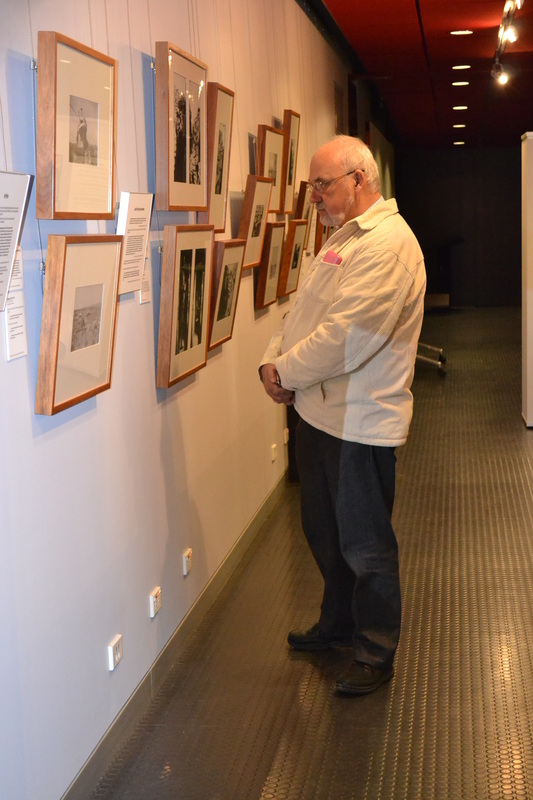 Mr Cassmob learning more about his great-uncle Walter Cass at the exhibition. 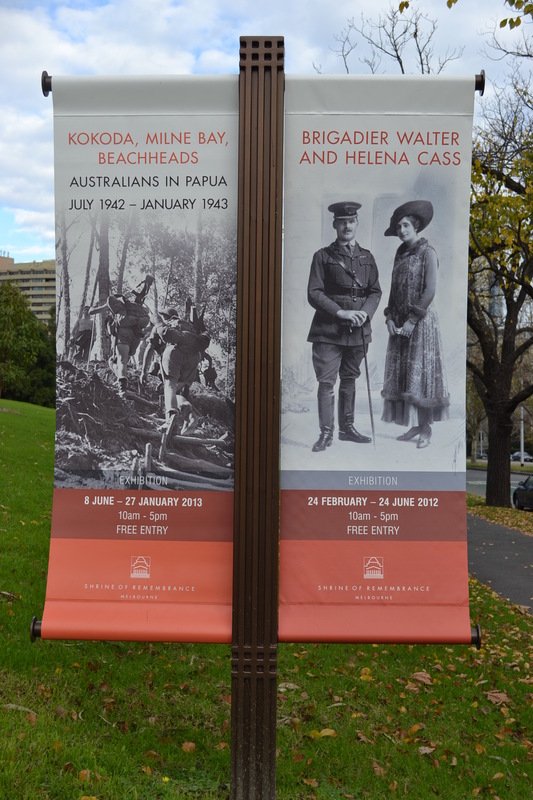 Our trip to Melbourne last month was primarily to visit an exhibition on Brigadier General WEH Cass and his wife Helena Holmes, and to meet some newly-found rellies. This exhibition is being held at the Shrine of Remembrance in Melbourne and has been extended until September. You might recall that I used “J is for Jealousy” in the Family History Alphabet series. If you are at all interested do go and visit this exhibition and you will see why I might use “jealousy”. The exhibition is primarily an amazing family collection of memorabilia which illustrates Walter Cass’s diverse career. There are invitation cards and souvenirs from the Durbar; formal gifts from Japanese naval officers who visited Australia officially pre-World War II; the cigarette case given to him by the Duke of York; some of his personal letters to Helena as well as his uniform and accoutrements. Cass was a keen and very good amateur photographer. The exhibition included his photos taken during the Boer War, Gallipoli and on the Western Front. Helena’s nurse’s uniform is featured as is her typewriter which she used to write her news stories, many published under her own by-line. It really is a fascinating display at a number of levels and while we might all wish for such a family inheritance of memorabilia, imagine the responsibility of caring for and preserving it all. If you plan to visit I suggest you ring in advance to ensure the room in which the exhibition is held is not being used for a public meeting. We had to wait around on both occasions we visited but it didn’t matter too much as it meant we were able to have a good look at the Kokoda exhibition which also featured Milne Bay during WW II. [i] http://www.awm.gov.au/collection/records/awm38/3drl606/awm38-3drl606-52-1.pdf Page 18. First read at the Australian War Memorial 1994. [ii] Another page of his personnel file also indicates he was wounded. [iii] Don’t Forget Me Cobber, the Battle of Fromelles, 19/20 July 1916. R S Corfield. Corfield and Company, Rosanna, Australia, page 146. [iv] Quote by HR Williams of the 56th Battalion from his book, The Gallant Company 1933, referenced in Don’t Forget Me Cobber, page 127. This entry was posted in Cass family history, Family History, World War I and tagged Fromelles, Helena Holmes, Shrine of Remembrance, WEH Cass, World War I by cassmob. Bookmark the permalink. I can understand the “Jealousy” Pauleen, how amazing would it be to have all that memorabilia. It is nearly impossible for us to understand what our soldiers went through. My great Uncle died from the residual effects of gas a couple of years after coming home from France in 1919. He was a private in the 7th Battalion and apparently no stories were passed on by him. I can understand why so many soldiers couldn’t speak of their horrendous experiences. I think each and every one of them had a story to tell but of course they were mostly not inclined to share with anyone who hadn’t been through it. I guess we’re lucky so much has been documented at it is. They were mostly young men and their lives were ruined in many ways. I would “love” to do a battlefields tour of the Western Front -I’ve visited a couple of places but I think there’d be a lot of benefit from hearing from the experts while in situ. I am editing a book on the Somme and would love a jpeg of the photo of Lieut-Col Walter Cass on your website. The pic of him (with the wrong initials) standing in uniform. thanks so much. I would of course acknowledge you in the book. How wonderful to have a whole exhibition on one of your relatives! There is talk of there being a 200 year celebration of the anniversary of the death of my 4x great grandfather in his home town in France in a couple of years – oh how I would like to get there for that! You and Mr CassMob must have been bursting with pride to see him, and his wife so honoured. Just wonderful!!! Did Mr C. shimmy up that flagpole, by any chance, and “souvenir” that amazing poster? Yes, the wartime experiences, of our loved ones, does have a profound effect which carries on through the generations… and so, national and family history become entwined. btw I recently bought “Somme Mud”, a first hand account written by 18yr old Private Edward Lynch who left Australia on 22 Aug 1916. It’s edited by Will Davies and published 2008 by Random House. He arrived as winter was setting in and the words in the Preface are very poignant “…little woud they have known… the war would become one of survival against the elements rather than simpy the Germans”. Research showed me that this was the story of my husband’s Grandfather’s experience which he refused to talk about. Thanks again. Thanks Catherine. It seems that it was the loss of so many of his men in one battle that brought him undone and he thought it had been poorly managed. Having one of those posters would have been a great thing but we were so absorbed in the exhibition that souveniring wasn’t on our minds-just as well as I’m not sure shimmying is on our repertoire anymore. I must ask his grand-daughter whether there was indication of on-going shell shock. Perhaps his long experience meant he regrouped but perhaps not. Indeed the weather was definitely as much an enemy as the Germans through those bitter years. I haven’t head of that particular book though I’ve read a number of others. Thanks for your empathy and comments.